Directions on use of this Myspace Skateboarder Silhouette - Olive Green Contact Table: Right-click the code box and select "Copy". Then paste it to the "About Me" section of your Myspace profile. 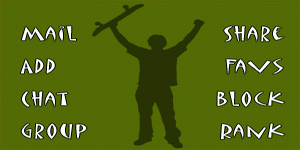 Skateboarder Silhouette - Olive Green Contact tables are also known as Myspace Skateboarder Silhouette - Olive Green Contact Boxes or Myspace Skateboarder Silhouette - Olive Green Contact Images.